It’s amazing how much the world changes before breakfast. At 6am Pacific this morning, a joint Intel & AMD press release hit our inboxes like a nuclear bomb: AMD and Intel are settling their differences. And just like that, the CPU landscape as we know it has significantly changed. We’re previously talked about the spat between AMD and Intel, one that Intel was looking increasingly likely to lose. AMD had had leveraged some very serious accusations against Intel over actions Intel supposedly undertook earlier this decade: paying OEMs and retailers not to use or carry products utilizing AMD processors through the use of discounts and rebates. With this AMD launched civil anti-trust suits, and petitioned various governments for criminal anti-trust investigations. Recently, the European Union’s European Commission agreed with AMD’s claims, resulting in the EC fining Intel for roughly $1.45 billion. And other governments had investigations in various states, including the New York Attorney General’s which opened up a case against Intel earlier this month. Things were not going well for Intel. With a major loss for Intel looming, the massive cost of many more years of litigation, and the monumental fine Intel would face if they lost a case in the United States (where damages are trebled), Intel and AMD sat down and began settlement talks in earnest in April, culminating in what has happened today. AMD and Intel have agreed to settle all of their outstanding litigation, Intel has agreed to adhere to certain business practices, Intel will be paying AMD, and the two companies have signed a new 5-year cross-licensing agreement for x86. We should note that even with this settlement, neither AMD nor Intel are admitting to any wrongdoing. Intel is not admitting to engaging in any anti-competitive actions, and AMD is not admitting to breaking their existing x86 license by not producing the bulk of their CPUs in-house. In laymen’s terms, everyone is agreeing to be happy and to stop bludgeoning each other with lawsuits. $1.25 billion in cold, hard cash. Intel will stop doing things that they and AMD agree they shouldn’t be doing. The right to not have to produce x86 CPUs in-house. AMD can go fabless. The right to have their x86 processors fabricated anywhere of AMD’s choosing. Although AMD and Intel don’t attribute anything to the cash portion of the settlement beyond the fact that it’s a number the two could agree on, we believe that it is intended to cover the legal costs AMD has incurred over the years in fighting Intel. Remember why Intel settled in the first place: anti-trust suits are expensive. AMD will receive the $1.25 billion in cash within 30 days. The second concession to AMD is that Intel and AMD have come to an agreement on which business practices Intel is and isn’t allowed to engage in, which Intel will have to adhere to. This is a tricky thing, since as we stated before Intel hasn’t admitted to any wrongdoing, so we’re not quite sure what practices are in question. Intel claims that this won’t result in any changes for them, but we will hopefully have a better idea once the agreement is published by the Securities and Exchange Commission. Without any additional information, our best guess is that whatever Intel was doing specifically to drive AMD out of the market, they have or are going to stop doing it. Moving on, it’s the 3rd concession that’s the biggest for AMD. Although the Intel/AMD x86 cross-licensing agreement is private, it’s well-known that the agreement stipulated that AMD needed to produce the majority of their x86 processors in-house. With the formation of Global Foundries, AMD was applying a new interpretation to that requirement, one that Intel disagreed with and lead to a side-suit between the companies. As part of this settlement, the in-house production requirement has been dropped from the cross-licensing agreement. AMD is no longer required to produce x86 CPUs, and as of today AMD has begun immediate preparation to go fully fabless. AMD has wanted out of the fab game for quite some time, but the cross-licensing agreement prevented that. Now AMD is free to sell off its stake of Global Foundries to Abu Dhabi’s Advanced Technology Investment Company (ATIC), who already owns the other half of GF. The result will be that ATIC will own a foundry like they’ve always wanted, and AMD will be rid of the task of operating a foundry like they’ve always wanted. This in turn is going to have two immediate short-term benefits for AMD. The first of course is more cash; selling their share in ATIC is going to net the company a fair bit of cash and cash equivalents. The second of which is that AMD had to absorb some of GF’s losses; they would have turned a profit last quarter for example if owning part of GF didn’t cause them to take a $100mil loss. So AMD is going to have more cash on hand, and they’re going to further resolve their long-standing cash bleed. By no means does this make them rich (they still are up to their eyes in debt), but this opens up a great deal of liquidity to invest in new processor designs. 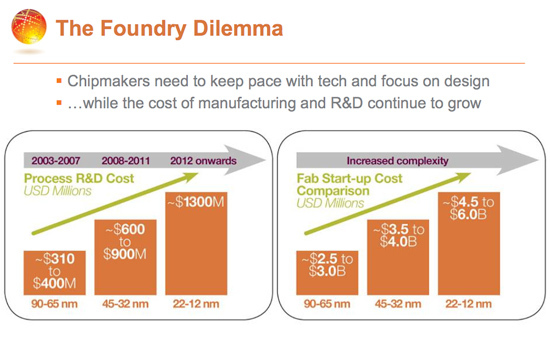 After all, they’ve gone fabless, R&D is where the bulk of their investments will be. Finally, we have the 4th concession: along with not having to produce CPUs in-house, AMD is free to have their x86 CPUs fabricated at any foundry of their choice. One of Intel’s points of contention have been that they don’t want to share x86 information with 3rd parties. Hence the requirement for in-house production in the first place. The settlement means that Intel will not object to AMD’s choice of foundry, opening them up to build CPUs at TSMC, UMC, and IBM, along with the continued use of Global Foundries. Given the cost and work involved in staying competitive with Intel’s fabrication advancements, we’re not sure who would be better prepared than GF, but the option is there on the table if AMD wants it. As we mentioned earlier, Intel’s constant battle with AMD was expensive for both sides. Intel faced a particular risk, as the fines and judgments against them should they lose in the United States would have been three-times the damages found by the courts. Basically, if Intel was going to lose, they were going to lose big. With this settlement, all of AMD’s private suits against Intel are immediately dropped. This means that Intel can immediately stop spending money on trying to fight those suits, and at the same time need not worry about what might happen if they were to lose. The key suit among these was an anti-trust suit in Delaware, which was set to begin in March. Meanwhile things are slightly more complex when it comes to AMD’s regulatory complaints. Since any action taken as a result of these is done by various government agencies, AMD cannot simply have these investigations dropped. What they can do is drop any formal complaints, and go to each regulatory body with Intel, where both will explain that they’ve settled their differences. Ideally, this will be enough to convince these regulatory bodies to drop their investigations. However these bodies are not compelled to do so, and may continue their investigations if they wish. However without AMD’s participation, it would be much harder for these bodies to win at their cases. The biggest regulatory case for Intel right now is the European Commission case, which is currently in appeal. It’s unlikely that the EC will drop the case after having already ruled against Intel, so the appeal is expected to go on as scheduled. Intel likely has lost this case for good, in spite of the settlement. Meanwhile Intel stands a far better chance of the New York Attorney General’s investigation dropped, along with investigations by US government agencies and foreign trade commissions. This may not sound nearly as substantial for Intel as it does AMD, but it’s impossible to overstate just how much Intel was at risk of losing here if every case went AMD’s way. Intel could have lost many billions of dollars, if not more. Not losing that kind of money makes for a very good deal for Intel. Ultimately, in spite of this being a “mutual” settlement, there’s no way to construct it as anything but a major win for AMD. Intel’s actions earlier this decade have presumably come at a great cost to AMD’s position, and this agreement codifies how that should never happen again. 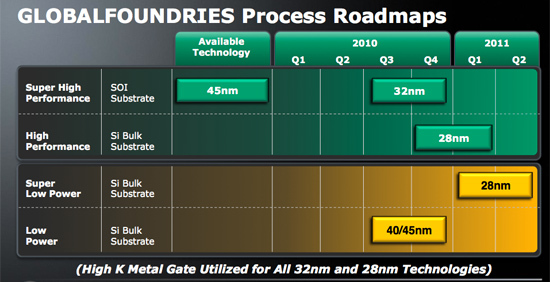 Meanwhile AMD is finally free to go ahead with their plans to go fabless, which will complete a significant shift for the company, and for Global Foundries. With this AMD’s immediate financial situation will greatly improve from the settlement cash, the sale of Global Foundries, and from GF no longer driving AMD in to the red. Or as Anand has summarized things, AMD will have the cash needed to go develop another CPU architecture, something essential to the company’s future survival. With the reality of AMD going fabless however, we will end on a cautionary note. While this settlement greatly improves AMD’s short-term situation, it does not change the long-term situation for the company. AMD is still faced with the challenge of being the first company to make a sustainable business out of fabless x86 CPU design. This settlement cements AMD’s plans going forward, for better or for worse. In time, we hope to see that it’s the right plan. I have followed the various pratices of Intel and AMD for some years, and never thought AMD after putting all this effort into litigation with the big I, would cave like this in the 11th hour, when by all indications the various lawsuits were going to be settled in mostly favourable terms towards AMD. My only thoughts about why it went this way is that AMD must have needed a quick settlement in order to get cash on the table AND to go fabless. Intel seemed to be prepared to throw piles of money at the various suits in the hope that AMD would go bankrupt beofre they saw a penny of restituion. Just wanted to say great job with the blog, today is my first visit here and I’ve enjoyed reading your posts so far. Late 90s/Early 2000's: Make MANY billions blocking your competition from selling its products, allowing you to gain a market share/technology/cash advantage. Late 00's: Get slap on the wrist for previous actions in the form of paying a now severely crippled competitor a fraction of the money made earlier, that is worth less than it was when you made it. They probably made more than $1.25B on just the interest from the profits they stole over the years. Exactly how well do the other fab shops stack up against Intel? Would it make it easier, cheaper, and/or faster for AMD to have 22nm chips, or is Intel simply much better than everyone else? If so, the long term outlook still wouldn't improve for AMD. They may be able to design competitive chips, but if they can't get them made, then what's the point? They still lose, right?